The implementation of eCommerce customization strategies is becoming increasingly important in order to increase sales and conversion rates. Taking actions such as working professionally in the management of an online store, providing an edge to improve the user’s experience and investing in user loyalty actions has become essential in the success of an eCommerce. Adapting to the user and providing content matching the user’s needs is key when we want to offer a customized purchasing experience. To do so, we can use a series of tools that will allow us to define eCommerce customization strategies, in a structured way and from a single control panel. When we talk about eCommerce customization, we talk about recommending products, adapting contents and communication. Below you can find a series of customization options provided by BrainSINS, a tool that is currently available and integrated in LogiCommerce. Product recommendations aim at encouraging the user to purchasing alternative or complimentary products, in order to increase the AOV (average order value). In order to improve their impact and visibility, these recommendations can be located in different strategic areas of the website such as the home page, the product’s profile and in the checkout process. Applying different recommendation strategies is possible thank to a powerful business rules engine, which allows the setting of completely customized configurations. Promotion of a specific set of products, categories or brands. We can take for granted that product recommendations are essential in any eCommerce as they have a great proven effectiveness. Tracking the behavior and performance of all our recommendation strategies with an analysis tool is another aspect to keep in mind in order to know how these contribute to our business. Should you need further information, you can check a recently posted article in our blog about cross selling and up selling. The customization of content allows the online shop not only to adapt the users’ shopping experience in real time, but also capturing leads and the creation of in-site campaigns. Thanks to BrainSINS’ Behavioral Targeting, it is possible to carry out in-site marketing actions and the modification in real time of a website without the constant support of the IT team, drastically reducing frictions and greatly optimizing resources. Capturing leads: It allows the creation of popups to capture leads, that will trigger when the user is trying to exit the online store or in response to any specified user behavior. Content adaptation: It allows the modification of content of the eCommerce, be it by the substitution, insertion or removal of content in order to adapt to the user’s needs. 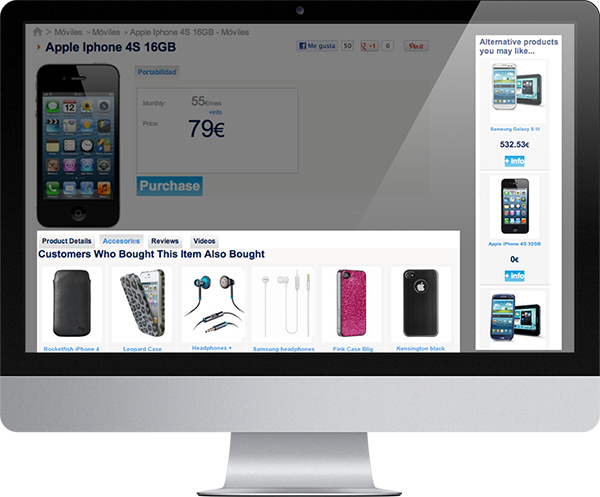 It allows adapting the online store to the customer’s behavior. Offering discounts: It allows the configuration of a pop-up displaying a discount for the new user’s first purchase, ensuring their conversion and including them in your database, providing the occasion to take advantage of the information the user has entered. The systems allows to swiftly create customization rules in a very intuitive way. 7% of the capture leads end up completing an order within a month. 3 sales increase for the capturing of leads. The measuring and tracking of the results can be carried out by an analytic tool, which will provide a general overview of the results of the applied strategy to the detail. Using LogiCommerce’s BrainSINS external tool it is possible to automatize the delivery of customized emails based on the users’ behavior. This tool offers a wide array of possibilities, 100% customizable, user friendly Email Automation System. Abandoned shopping cart recovery: Automation of the delivery of customized emails to recover shopping carts and abandoned orders. It also allows the configuration of different workflows and messages. Automation of the delivery of email with the products the users in which the users have been interested in, with the goal to redirect the users back to the website. Automation of customized newsletters for every single user, offering the chance to segment the delivery frequency depending on the user’s activity level. Email recommendations: Email delivery with customized product recommendations, be it in the form of newsletters, order confirmation emails, etc. Product Merchandising: The Product Merchandising system provides a tool for the promotion of certain products and categories via email. You can manage these emails with a complete WYSISWYG editor tool, where the styles of the emails can be edited in a few minutes. It also allows the edition of texts, adding logotypes, changing the color of the buttons, contact data, etc, as well as editing the HTML and CSS of the emails for a further customization of these emails. It is also possible to segment the emails depending on the user’s behavior the value and content of the shopping cart/order. Should you need further information to implement these features in your online store and begin to work with customization strategies, feel free to contact us: We will be delighted to help you.